Happy New Year! I hope everyone enjoyed the holidays. My favorite part of the holidays aren't the big celebrations, but the quiet evenings by the Christmas tree and fire. It's one of the reasons I still haven't taken down my tree yet. I just love when it lights up at 5 o'clock every evening. My husband said I should just buy a big ficus tree and put lights on it to enjoy all year. I really lol'd at that one! The bright side of the holidays being over is that I can focus on the projects I've been putting off the past couple of months, namely the home office. I started planning out the design this summer, but kept changing my mind. I have to admit it was all due to not wanting to spend a lot of money on a room that isn't regularly used or seen by visitors. My first thought was to hire someone to build built-in bookshelves. That's what all legit home offices need, right? My biggest inspiration came from a model home in my own neighborhood. When I saw this study I wanted to copy every detail (minus the furniture). 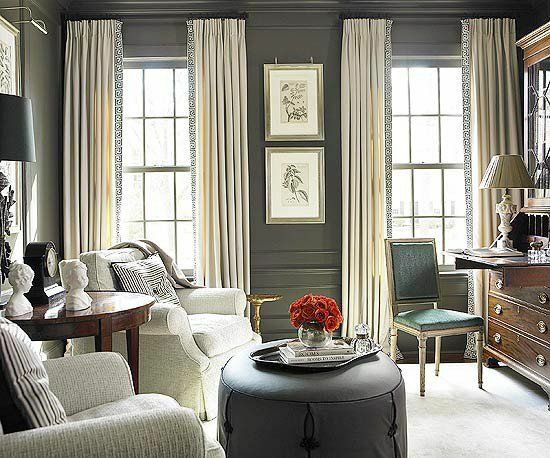 The dark gray paneled walls, the bookcases and the sconces were exactly what I had in mind. I would have added filing drawers to the bottom of the bookshelves to be more functional. When I started dissecting the details on the actual cost that's when I realized the millwork was going to be very expensive. My husband and I can DIY the wainscoting, but not the bookshelves. That's when I decided to skip the non-functional shelves and just work on the wainscoting. I've found several examples of beautiful wainscoting. It has made my decision a bit harder. I could go with paneled walls all around the room. We would just paint the walls the same color as the trim so it would be faux. I thought about using wood floor to ceiling, but the cost of materials would be too expensive. I really don't want to redo the baseboards and the crown either. Another option would be to wallpaper the room in grasscloth and use trim. It would avoid the faux wood look of the walls. The cost of the wallpaper and having to hire someone to hang it made me hesitate on this option. It also seems less like an study and more of a bedroom look. I decided to scrap this one, but I still want to show you the picture because it's so pretty. I may end up with his look in another room! A third option is to partially panel the room. I could have wainscoting to the ceiling on the main wall behind the desk and then only on the bottom half on the other three walls. The top could be painted and maybe eventually wallpapered by myself. I think I might be able to handle small sections. 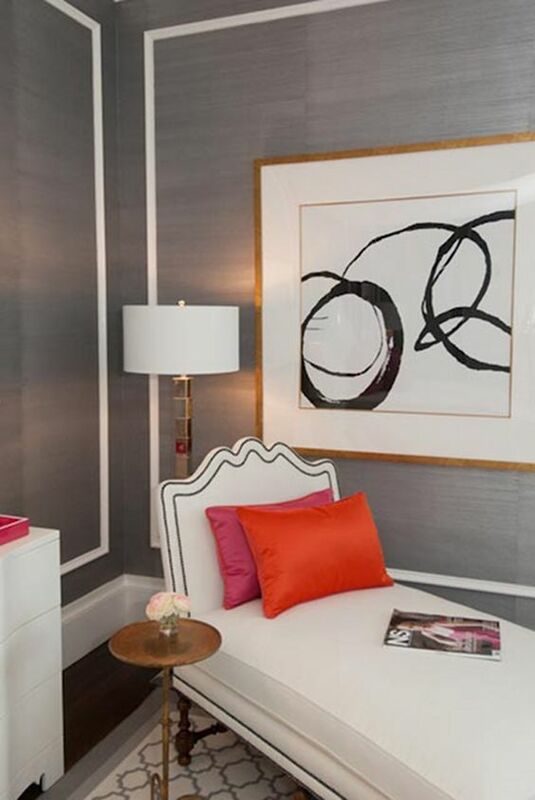 I just love the shine of grasscloth, but I would also get the paneled study look with this option. I'm leaning towards this idea. We decided to start hanging the moldings today! I just need to have my coffee and breakfast taco first. We're going with the last option, but we can always go back and add trim to the top of the last three walls if we decide that would look better. The next decision is the color of the trim, which will either be white or gray to go with the rest of the house. If we go with white wainscoting the other three walls with be painted gray or have gray wallpaper. If we go with gray wainscoting the walls will be a sand color like in the above photo. The first step is to get the moldings up. If everything goes correctly I'll post progress photos on my Instagram stories!